Located in Amarante, between the city of Porto and the Douro Valley, Casa da Calçada - a member of the Relais & Châteaux hotels association - has majestic scenery and idyllic scenery that inspires discovery. Declared by the Portuguese Government as a building of great architectural, historical and cultural interest, it preserves its original baroque style keeping the neoclassical elements in a romantic environment that invites you to travel through the past in a remarkably familiar and cosy atmosphere. Casa da Calçada was built during the 16th century to be one of the main palaces of the Count of Redondo. During the French Invasions, the allies commands (English and Portuguese) were settled in there. In the beginning of the 20th century, it became an important meeting point for politicians and intellectual, led by its owner António do Lago Cerqueira, born in the palace in 1880 and one of the most important political leaders of the First Portuguese Republic. The political career of Lago Cerqueira was, however, interrupted by his exile in France, where he specialized in the new vine planting techniques. He wrote about Portuguese wines and, after his return to Portugal, he applied these new techniques in the vineyards surrounding the palace and he became a major producer of Vinho Verde in our country. The property was completely restored in 2001 and is now one of the most iconic and emblematic hotels of Portuguese hospitality, becoming, in November of 2003, a member of the prestigious RELAIS & CHATEAUX chain. The recovery of the Casa da Calçada preserved the original baroque style by keeping the neoclassical elements. The décor follows the romantic style that transmits through furniture, fabrics and decorative details, the atmosphere of a family home, where guests return to the past, benefiting from the cosy tranquillity of the palace many corners. This boutique hotel offers a total of 26 rooms and 4 suites is located in the centre of Amarante and has views of the historic centre and Tâmega River. Amongst the various facilities offered by the hotel, there is an outdoor swimming pool and a golf course of 18 holes nearby. The elegant rooms and suites of Casa da Calçada have antique but renewed furnishings and accessories and an antique décor combined with modern amenities. Thinking of the maximum relaxation of its guests, Casa da Calçada has a SPA room equipped to ensure a unique sensations trip where body and spirit will find their balance, with the quality products - ALQVIMIA. Guests can also enjoy local specialities with an international flair in the hotel restaurant. The bar serves a selection of wines produced in the Douro Valley, in the Vinho Verde region and champagne produced in the hotel. Casa da Calçada offers special monthly events related to the art of good eating, wine tasting, gourmet menus matched with the best Portuguese wines and cooking classes. Prestigious restaurant with 1 Michelin star, offers an exquisite yet cosy atmosphere and a professional team of the highest level. The award-winning cuisine of the Casa da Calçada Relais & Châteaux seeks to highlight the gastronomic Portuguese roots, complementing between contemporary and traditional with fresh products and originality. Chef Vitor Matos is responsible for the kitchen. As sumptuous as the rest of the hotel, large armchairs invite you to relax comfortably or enjoy the lovely views of the river and the village from the huge terrace. A truly magical place both day and night. Offers bar services on the swimming pool area during the summer. If it is difficult for you to imagine anything more splendid than the panoramic views bathed in the special light of the setting sun, imagine all this with a fresh bottle of the sparkling wine produced in the surrounding wineries. Casa da Calçada has 5 meeting rooms with capacity from 14 to 300 guests. Every room is fully equipped to perform different types of events. Inaugurated in 1997, the Amarante Golf was designed by the Portuguese architect Jorge Santana da Silva that successfully combined on the course of Amarante the necessary ingredients: the splendour of Nature in all its beauty and calm with 18 holes of pure challenge. Throughout the years, many professional golf events have been organized here; official tournament of the Portuguese Golf Federation and other commercial events of of major brands in different sectors. Since it is not a very long field in the 18 holes of the course are three par 5 holes, eight Par 4 holes and seven Par 3 holes. Casa da Calçada is located in the historic centre of Amarante, near the old bridge over the River Tâmega, opposite the Church of Saint Gonçalo. From Porto, take the motorway A3 Braga/Vila Real and connect with A4 Vila Real / Valongo until exit 17 Amarante Este. Follow towards Amarante Centre. 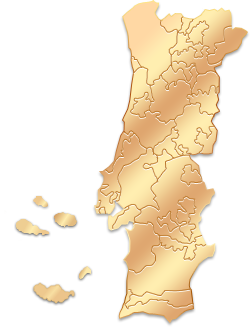 From Lisbon, take the motorway A1 to Porto and on the VCI take the connection to motorway A3 Braga/Vila Real and then take motorway A4 Vila Real / Valongo until exit 17 Amarante Este. Follow towards Amarante Centre. GPS: N41º 16'06.00'', W 8º 4'41.03"